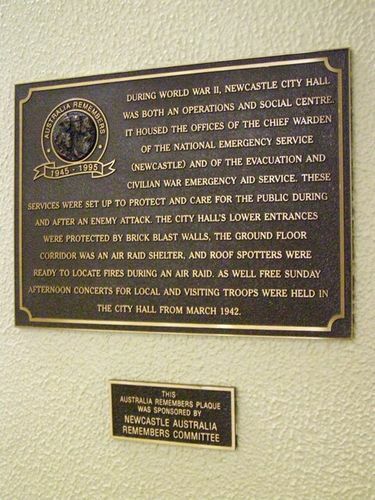 The Australia Remembers Plaque commemorates the 50th anniversary of the end of World War Two and details the role of Newcastle City Hall during that conflict. DURING WORLD WAR 11, NEWCASTLE CITY HALL WAS BOTH AN OPERATIONS AND SOCIAL CENTRE. IT HOUSED THE OFFICES OF THE CHIEF WARDEN OF THE NATIONAL EMERGENCY SERVICE (NEWCASTLE) AND OF THE EVACUATION AND CIVILIAN WAR EMERGENCY AID SERVICE. THESE SERVICES WERE SET UP TO PROTECT AND CARE FOR THE PUBLIC DURING AND AFTER AN ENEMY ATTACK. THE CITY HALL'S LOWER ENTRANCES WERE PROTECTED BY BRICK BLAST WALLS, THE GROUND FLOOR CORRIDOR WAS AN AIR RAID SHELTER, AND ROOF SPOTTERS WERE READY TO LOCATE FIRES DURING AN AIR RAID. AS WELL AS FREE SUNDAY AFTERNOON CONCERTS FOR LOCAL AND VISITING TROOPS WERE HELD IN CITY HALL FROM MARCH 1942.